Erich Wolfgang Korngold: Caprice fantastique "Wichtelmännchen"
Felix Mendelssohn: Song, Op. 8 #8, Andrés Maienlied "Hexenlied"
William Bolcom: Concert Variation for Violin & Piano "Graceful Ghost"
Giuseppe Tartini: Sonata for Violin and Basso Continuo in G minor, Op. 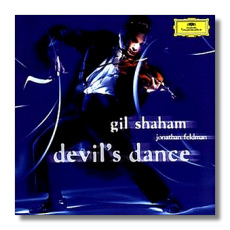 1 no 4 "Devil's Trill"
Gil Shaham really gives the Devil his due with this CD. Released earlier this fall, presumably to cast its spell over Halloween-themed sales, it's still enjoyable as the weather grows even colder, and as thoughts of Scrooge's Christmas ghosts begin to haunt the air. Even outside of heavy metal (! ), demonic music is not too difficult to find. If the repertoire is limited to works for violin, however, the cupboard is more bare. The solution here has been to rely on transcriptions to fill the program out. Thus, we have Grieg's Puck arranged by Achron, Korngold's Caprice fantastique arranged by Révay, and Saint-Saëns's Danse macabre arranged (I think) by himself. So Jonathan Feldman wouldn't feel left out, I suppose, we also have Schumann's arrangement of Paganini's 13th Caprice, which adds an unnecessary piano part. The variety of music is gratifying, from film music by John Williams ("Devil's Dance" from The Witches of Eastwick) and John Morris ("A Transylvanian Lullaby" from Young Frankenstein) to Sarasate's charmingly silly Concert Fantasy on Gounod's "Faust." Other works include Tartini's "Devil's Trill" Sonata (or rather, Kreisler's reworking thereof), Bazzini's La ronde des lutins (so creaky it should be heard against a backdrop of wind-up Victrola noise), and the opening of Ysaÿe's Second Violin Sonata, with its unhealthily insistent quotations from a Bach partita. This program is designed to showcase Shaham's brilliant playing and full sound. Shaham, a Juilliard grad, has a technique that has seen few equals and the winning charisma to go along with it. His recordings of some of the basic repertoire have not always gone very far beneath the music's surface. Here, there's no problem, because Shaham doesn't have to be penetrating or philosophical, just clever and amusing – indeed, his playing on this disc is as witty as I've ever heard it. His ready access to all kinds of tone colors and playing-styles, from the richest portamento to the most creepy-crawly spiccato effects, makes even a lightweight pictorial work such as Korngold's Caprice fantastique sound like a masterpiece. There's nothing on this disc that doesn't come off well – can Shaham have sold his soul to the Devil, as Paganini himself was rumored to have done? It would be easy to overlook pianist Jonathan Feldman, but don't, because he has to play some exceedingly difficult music on this CD, and he does it with no less success than Shaham. I received an early promo copy of this CD without a booklet, so I can't comment on the notes. I can say that the engineering gives the violin and piano unwonted realism and spatial presence. This Devil's Dance is too late for Halloween, perhaps, but not too late to enjoy.